Provincetown is perched on the uppermost tip of Cape Cod. 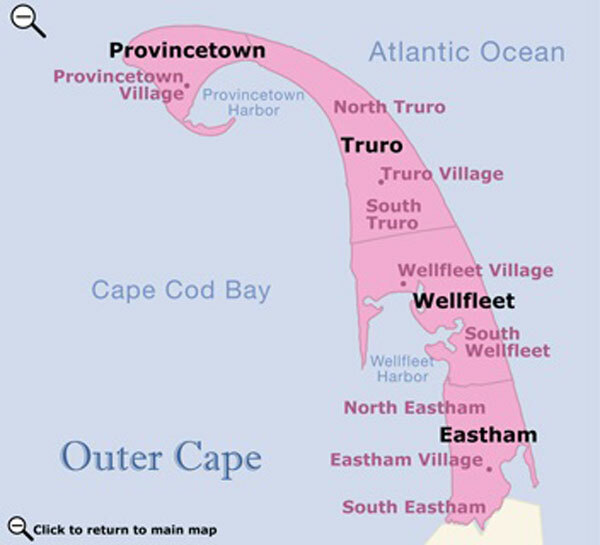 In the summer, the population of this quaint fishing port swells to 30,000. "P-Town," as it is known by many, is a cosmopolitan mix of people and a haven for artists, writers, actors, and musicians. It also offers the Cape's wildest nightlife. Narrated trolley tours through town take visitors past historic sights and clusters of tiny, picturesque homes surrounded by flower gardens and white fences. On a clear day, it is possible to have a 360° view of the entire Cape from the top of Pilgrim Monument. 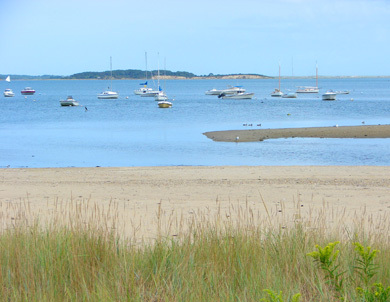 There are more than 30 miles of beaches in Provincetown, with two lifeguarded beaches—Herring Cove, which has calm waters, and Race Point, with its long breakers. Miles of paved walking and biking trails along the National Seashore provide visitors with views of ponds, cranberry bogs, and forests of small pines. The waters around Provincetown are home to three species of whales—the fin, humpback, and right whale. Whale-watching boats leave regularly from MacMillan Pier and Fisherman's Wharf.